Northeast India is the eastern-most region of India connected to East India via a narrow corridor squeezed between Nepal and Bangladesh. It comprises the contiguous Seven Sister States (Arunachal Pradesh, Assam, Manipur, Meghalaya, Mizoram, Nagaland, and Tripura), plus the Himalayan state of Sikkim. These states are grouped under the MDONER ministry of the Government of India. Except for the Goalpara region of Assam, the rest were late entrants to the British India, the Brahmaputra valley area of Assam became a part of British India in 1824, and the hill regions were incorporated even later. Sikkim was annexed to the Indian union through a referendum in 1975 and was recognised as part of Northeast India in the 1990s. The Siliguri Corridor in West Bengal, with a width of 21 to 40 kilometres (13 to 25 mi), connects the North Eastern region with the main part of India. The region shares more than 4,500 kilometres (2,800 mi) of international border (about 90 per cent of its entire border area) with China (South Tibet) in the north, Myanmar in the east, Bangladesh in the southwest, and Bhutan to the northwest. The earliest settlers were Austro-Asiatic speakers, followed by Tibeto-Burmese and then by Indo-Aryans. Due to the bio- and crop diversity of the region the focus of current archaeological research has been on domestication of several important plants by early settlers. Writers have suspected an early trade route via Northeast India in the references of Chinese explorer, Zhang Qian made in 100 BC. The Periplus of the Erythraean Sea mention a people called Sêsatai in the region, who were the source of malabathron, so prized in the old world. In the early historical period (most of first millennium), Kamarupa straddled most of present-day Northeast India, besides Bhutan and Sylhet in Bangladesh. Xuanzang, the traveling Chinese monk, visited Kamarupa in the 7th century, and described the people as "short in stature and black-looking", whose speech differed a little from mid-India and who were of simple but violent disposition; and that the people in Kamarupa knew of Sichuan that lay to the kingdom's east beyond a treacherous mountain. Established during the British Raj, the northeastern states were isolated from their traditional trading partners such as Bhutan and Myanmar. 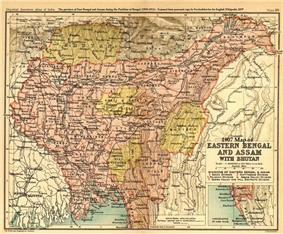 In the early 19th century, both the Ahom and the Manipur kingdoms fell to a Burmese invasion. The ensuing First Anglo-Burmese War resulted in the entire region coming under British control. In the colonial period (1826-1947), North East India was a part of Bengal Province from 1839 to 1873, when Assam became its own province. After the Indian Independence from British Rule in 1947, the Northeastern region of British India consisted of Assam and the princely states of Manipur and Tripura. Subsequently, Nagaland in 1963, Meghalaya in 1972, Arunachal Pradesh in 1975 (Capital changed to Itanagar) (actually formed on 20 Feb, 1987) and Mizoram in 1987 were formed out of Assam. Manipur and Tripura remained as Union Territories of India between 1956 until 1972 when they attained fully-fledged statehood. Sikkim was integrated as the eighth North Eastern Council state in 2002. The city of Shillong acted as the capital of the Assam province created during the British Rule. It remained as the capital of undivided Assam until formation of the state of Meghalaya in 1972. The capital of Assam was then shifted to Dispur, a part of Guwahati, and Shillong became the capital of Meghalaya. in 1944, the Japanese planned a daring attack on India. Traveling through Burma, it was stopped at Kohima and Imphal by British and Indian troops. This marked the furthest western expansion of the Japanese Empire and presaged Allied victory. 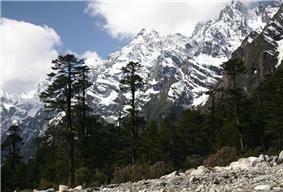 Arunachal Pradesh, a state in the Northeastern tip of India, is claimed by China as South Tibet. Sino-Indian relations degraded during the Sino-Indian War of 1962. The cause of the escalation into war is still disputed by both Chinese and Indian sources. During the war in 1962, the PRC (China) captured much of the NEFA (North-East Frontier Agency) created by India in 1954. However on November 21, 1962, China declared a unilateral ceasefire, withdrew its troops 20 kilometres (12 mi) behind the McMahon Line and returned Indian prisoners of war in 1963. In 1947 Indian independence and partition resulted in a landlocked region, exacerbating the isolation that has been recognized, but not studied. Muslim Bangladesh controlled access to the Indian Ocean. The mountainous terrain has hampered the road and railways connection in the region. On 2 November 2000, in Malom, a town in the Imphal Valley of Manipur, ten civilians were shot and killed while waiting at a bus stop. The incident, known as the "Malom Massacre", was allegedly committed by the Assam Rifles, one of the Indian Paramilitary forces operating in the state. This incident resulted in continuing unrest in the area. The militant groups operating in the area include the Assam and North Bengal, National Democratic Front of Bodoland and ULFA of Assam and the National Liberation Front of Tripura (NLFT). The Northeast region can be physiographically categorised into the Eastern Himalayas, Northeast Hills (Patkai-Naga Hills and Lushai Hills) and the Brahmaputra and the Barak Valley Plains. Northeast India (at the confluence of Indo-Malayan, Indo-Chinese, and Indian biogeographical realms) has a predominantly humid sub-tropical climate with hot, humid summers, severe monsoons and mild winters. Along with the west coast of India, this region has some of the Indian sub-continent's last remaining rain forests which supports diverse flora and fauna and several crop species. Similarly, reserves of petroleum and natural gas in the region constitute a fifth of India's total potential. The region is covered by the mighty Brahmaputra-Barak river systems and their tributaries. Geographically, apart from the Brahmaputra, Barak and Imphal valleys and some flat lands in between the hills of Meghalaya and Tripura, the remaining two-thirds of the area is hilly terrain interspersed with valleys and plains; the altitude varies from almost sea-level to over 7,000 metres (23,000 ft) above MSL. The region's high rainfall averaging around 10,000 millimetres (390 in) and above creates problems of ecosystem, high seismic activity and floods. 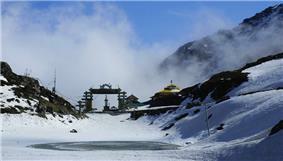 The states of Arunachal Pradesh and Sikkim have a montane climate with cold, snowy winters and mild summers. WWF has identified the entire Eastern Himalayas as a priority Global 200 Ecoregion while Conservation International has upscaled the Eastern Himalaya Hotspot which initially covered the states of Arunachal Pradesh, Sikkim, Darjeeling Hills, Bhutan, and Southern China to the Indo Burma (Hotspot) which now includes all the eight states of North-East India, along with the neighbouring countries of Bhutan, southern China and Myanmar. The population and diversity of the region’s birds largely reflects the diversity of habitats associated with a wide altitudinal range. North East India supports some of the highest bird diversities in the orient with about 850 bird species. The Eastern Himalaya and the Assam plains have been identified as an Endemic Bird Area by the Royal Society for Protection of Birds, (ICBP 1992). The global distribution of 24 restricted-range species is limited to the region. The region’s lowland and montane moist-to-wet tropical evergreen forests are considered to be the northernmost limit of true tropical rainforests in the world. The region has been identified by the Indian Council of Agricultural Research as a centre of rice germplasm while the National Bureau of Plant Genetic Resources (NBPGR), India, has highlighted the region as being rich in wild relatives of crop plants. It is the centre of origin of citrus fruits. Two primitive variety of maize, Sikkim Primitive 1 and 2 have been reported from Sikkim (Dhawan, 1964). Although jhum cultivation, a traditional system of agriculture, is often cited as a reason for the loss of forest cover of the region, this primary agricultural economic activity practised by local tribes reflects the usage of 35 varieties of crops. The region is rich in medicinal plants and many other rare and endangered taxa. Its high endemism in both higher plants, vertebrates and avian diversity has qualified it to be a biodiversity ‘hotspot’ and this aspect has been elaborated in details in the subsequent sections. In 1995, International Union for Conservation of Nature identified Namdapha in Arunachal Pradesh as a centre of plant diversity. 51 forest types are found in the region broadly classified into six major types — tropical moist deciduous forests, tropical semi evergreen forests, tropical wet evergreen forests, subtropical forests, temperate forests and alpine forests. These forests harbour 8,000 out of 15,000 species of flowering plants. In floral species richness, the highest diversity is reported from the states of Arunachal Pradesh (5000 species) and Sikkim (4500 species) amongst the North Eastern States. According to the Indian Red data book published by the Botanical Survey of India, 10 percent of the flowering plants in the country are endangered. Of the 1500 endangered floral species, 800 are reported from North East India. Most of the North Eastern states have more than 60% of their area under forest cover, a minimum suggested coverage for the hill states in the country. North East India is a part of Indo-Burma 'hotspot'. The hotspot is the world's second largest, next only to the Mediterranean basin with an area 2,206,000 square kilometres (852,000 sq mi) among the 25 identified. The International Council for Bird Preservation, UK identified the Assam plains and the Eastern Himalaya as an Endemic Bird Area (EBA). The EBA has an area of 220,000 km2 following the Himalayan range in the countries of Bangladesh, Bhutan, China, Nepal, Myanmar and the Indian states of Sikkim, northern West Bengal, Arunachal Pradesh, southern Assam, Nagaland, Manipur, Meghalaya and Mizoram. Because of a southward occurrence of this mountain range in comparison to other Himalayan ranges, this region has a distinctly different climate with warmer mean temperatures and fewer days with frost and have much higher rainfall. This has resulted in the occurrence of a rich array of restricted range bird species. More than two critically endangered species, three endangered species and 14 vulnerable species of birds are in this EBA. Stattersfield et al. (1998) identified 22 restricted range species out of which 19 are confined to this region and the remaining three are present in other endemic and secondary areas. Eleven out of the 22 restricted range species found in this region are considered as threatened (Birdlife International 2001), a number greater than in any other EBA of India. Spread over an area of 1,985 square kilometres (766 sq mi) in Arunachal Pradesh, Namdapha National Park is the largest national park of the northeast region. Situated 150 kilometres (93 mi) from Miao (district headquarters on the Indo-Burma border), Namdapha National Park is one of the largest wildlife protected areas in India. The altitude rises from 200 to 4,500 metres (660 to 14,760 ft) in the snow-capped mountains. The ecosystem abounds in more than 150 species of timber. Important rare fauna species include Pinus Merkusi, Abies Delavavi, Blue Vanda and Mishimi Teeta. The Namdapha Tiger reserve in Changlang district of Arunachal Pradesh, in an area of 1,850 square kilometres (710 sq mi) rugged terrain, is home to feline species such as tiger, clouded leopard, snow leopard and lesser cats. Primates such as Assamese macaque, pig-tailed macaque, stump-tailed macaque, Hoolock gibbon, ape besides other mammals (elephant, Asian black bear, Indian bison, deer), birds (white-winged wood duck, Great Indian hornbill, Jungle fowl, pheasant) and reptiles add to the rich fauna diversity. Wildlife sanctuary and a World Heritage Site (declared by UNESCO), in the Barpeta district of Assam and partly along Bhutan foothills, the Manas National Park is shelter to rare species of as many as 55 mammals, 50 reptiles, 380 birds and 3 amphibians. Besides tiger, elephant, rhinoceros and wild water buffalo, leopard, pigmy hog, red panda, swamp deer, capped langur, sambar, hispid hare, golden langur, fowl, bulbul, brahminy duck, Indian Grey Hornbill and roofed turtle are protected in the Manas National Park. It is also an Elephant Reserve and Biosphere Reserve. Spread over an area of approximately 430 square kilometres (170 sq mi), 217 kilometres (135 mi) from Guwahati, with annual rainrfall of 2300 mm, Kaziranga National Park is on the bank of Brahmaputra river with its swamps and tall thickets of elephant-grass. It is home to the world's largest population of Great Indian one-horned rhinoceros, largest of the three Asian rhinos. The grasslands of semi-evergreen forest are inhabited by leopard, elephant, barasingha or swamp deer, barking deer, wild boar, hog deer, bison, otter, hoolock gibbon, golden langur, wild water buffalo, capped langur, pygmy hog, bear, grey-headed fish eagle, Pallas's Fish Eagle, Crested serpent eagle, swamp partridge, red jungle fowl, Bengal florican, whistling teal, pelican, red-breasted parakeet, black-necked stork, adjutant stork, open-bill stork, egret, heron, white-winged wood duck, rock python, monitor lizard, turtle and other commonly found species. Also known as 'Mini Kaziranga', the Orang National Park is on the northern bank of the river Brahmaputra, in the state of Assam, covering 78.81 square kilometres (30.43 sq mi). Established as a sanctuary in 1985 and declared a National Park in 1999, it is 32 kilometres (20 mi) from Tezpur and 120 kilometres (75 mi) from Guwahati. The terrain slopes gently from north to south covered with natural forest vegetation like Bombax ceiba, Dalbergia sisoo, Sterculia villosa, Trewia nudiflora, Zizypphus jujuba, Litsaea polyantha and other non-aquatic grassland species. one-horned rhinoceros, Royal Bengal tiger, Asiatic elephant, hog deer, wild boar, civet, leopard, hare, porcupines and commonly found birds and reptiles in the region. Orang National Park is an important habitat of the Bengal florican. Situated in the Morigaon district of Assam, about 50 kilometres (31 mi) from Guwahati, Pobitora Wildlife Sanctuary covers 38.8 square kilometres (15.0 sq mi) and is famous for Great Indian one-horned rhinoceros. The sanctuary also protects Asian Buffalo, Leopard, Wild bear, civet, reptiles and some 2000 migratory birds. 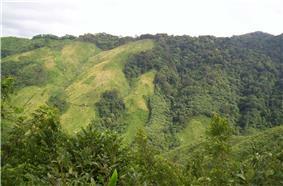 Sipahijola Wildlife Sanctuary is a Wildlife Sanctuary in Tripura, India. It covers an area of about 18.53 square kilometres (7.15 sq mi) and is located about 25 kilometres (16 mi) from the city centre. It is a woodland with an artificial lake and natural botanical and zoological gardens. The Sanctuary boasts of abounding congregation of wildlife, especially birds and primates, the terrain is absolutely green throughout the year and so is the beautiful weather except for the two humid summer months of March and April. It gives shelter to about 150 species of birds and the unique bespectacled monkey (Phayre's Langur). 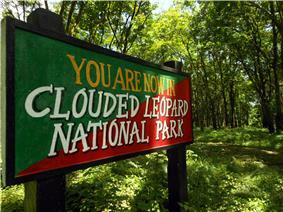 Keibul Lamjao National Park is about 53 kilometres (33 mi) from Imphal in Manipur. Temperatures range from a maximum of 34.4 °C (93.9 °F) to a minimum of 1.7 °C (35.1 °F). Established as a Wildlife Sanctuary in 1966, it became a National Park in 1977. The area of the park, about 40 square kilometres (15 sq mi), mostly comprises wetlands overgrown with 1.5 metres (4 ft 11 in) deep floating vegetation called Phumdi. Loktak lake, the largest fresh water lake in India, falls primarily within the park. Brow-antlered deer (Sangai in Meitei dialect) is particularly popular among the species of deer that abounds here. Extremely rare lesser cats like the marbled cat and Temminck's golden cat, Himalayan black bear, Malayan Bear, Black eagle, Shaheen Falcon, Great white pelican, Bamboo-partridge and Green Peafowl, Hooded Crane, Brown Hornbill, Wreathed Hornbill, Great Pied Hornbill (Great Indian Hornbill) constitute the diverse fauna in the park. According to 2001 census, the total literacy rate of the population in the region at 68.5 per cent, with female literacy rate at 61.5 per cent, is higher than the country's average of 64.8 per cent and 53.7 per cent respectively. There are variations in the literacy rates among different states with Assam, Arunachal Pradesh and Meghalaya below the national average while Mizoram and Tripura tops the list not only in the following region but in the entire nation. Largest cities according to population of census 2011 are Guwahati, Agartala, Shillong, Aizawl, Imphal, Silchar, Dibrugarh, Nagaon, Jorhat, Dimapur, Darjeeling, Gangtok and Kohima. Northeast India constitutes a single linguistic region with about 220 languages in multiple language families (Indo-European, Sino-Tibetan, Tai–Kadai, Austroasiatic) that share common structural features. Assamese, an Indo-Aryan language spoken mostly in the Brahmaputra Valley, developed as a lingua franca for many speech communities. Assamese-based pidgin/creoles have developed in Nagaland (Nagamese) and Arunachal (Nefamese), though their use has been on a decline in recent times. The Austro-Asiatic family is represented by the Khasi, Jaintia and War languages of Meghalaya. A small number of Tai–Kadai languages (Ahom, Tai Phake, Khamti, etc.) are also spoken. Sino-Tibetan is represented by a number of languages that differ significantly from each other, some of which are: Bodo, Rabha, Karbi, Mising, Tiwa, Deuri etc. (Assam); Garo, (Meghalaya) Ao, Tangkhul, Angami, Sema, Lotha, Konyak etc. (Nagaland); Mizo, Hmar,Chakma (Mizoram); Hrusso, Tanee, Nisi, Adi, Abor, Nocte, Apatani, Misimi etc. 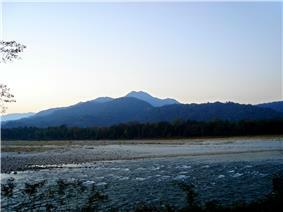 (Arunachal). Manipuri is the official language in Manipur, the dominant language of the Imphal Valley; while Naga languages such as Mao, Maram and Tangkul, and Kuki languages such as Hmar and Paite predominate in individual hill areas of the state. Among other Indo-Aryan languages, Sylheti is spoken in South Assam in the Barak Valley. 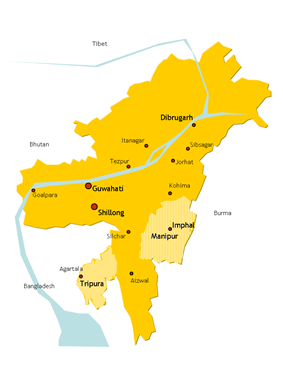 Besides the Sino-Tibetan Tripuri language, Bengali is a majority language in Tripura. Nepali, an Indo-Aryan language, is dominant in Sikkim, besides the Sino-Tibetan languages Limbu, Bhutia and Lepcha. Bengali was the official language of Colonial Assam for about forty years from the 1830s. Northeast India has over 220 ethnic groups and equal number of dialects. The hills states in the region like Arunachal Pradesh, Meghalaya, Mizoram and Nagaland are predominantly inhabited by tribal people with a degree of diversity even within the tribal groups. Besides the indigenous inhabitants people from Tibet, Burma, Thailand, West Bengal and Bangladesh have migrated into the region at various periods of history. Adivasi, Assamese, Bhutia, Bishnupriya Manipuri, Biate, Bodo , Chakma, Chhetri, Dimasa, Garo, Gurung, Hajong, Hmar, Hrankhwl, Jamatia , Karbi, Khasi, Khampti, Koch, Kom, Kuki, Lepcha, Lushai, Meitei, Mishing, Mizo, Naga, Nepali, Noatia , Paite, Pnar, Purvottar maithili, Rabha, Reang, Singpho, Sylheti, various Tibetan tribes, Tamang, Tiwa, Tripuri, Zeme Naga, Chorei and Limbu are different ethnic groups inhabitating the region. The northeastern states, having 3.8% of India's total population, are alloted 25 out of a total of 543 seats in the Lok Sabha This is 4.6% of the total number of seats. ^ a b "North East India internation border". Retrieved 25 March 2012. ^ "North Eastern Council". Retrieved 25 March 2012. ^ "North East Development Finance Corporation Ltd.". Retrieved 25 March 2012. ^ "Ministry of Development of North Eastern Region (DoNER)". Retrieved 25 March 2012. ^ Hazarika, M. 2006 Neolithic Culture of Northeast India: A Recent Perspective on the Origins of Pottery and Agriculture. Ancient Asia, 1, DOI: http://dx.doi.org/10.5334/aa.06104. ^ "Integration of Sikkim in North Eastern Council". Times of India. 10 December 2002. Retrieved 25 March 2012. ^ Anjuman Ara Begum (3 November 2010). "AFSPA and Unsolved massacres in Manipur". Twocircles.net. Archived from the original on 21 October 2012. Retrieved 21 October 2012. ^ Imphal Free Press (2 November 2013). "Malom Massacre horror relived 13 years later". http://kanglaonline.com/. Retrieved 11 November 2013. 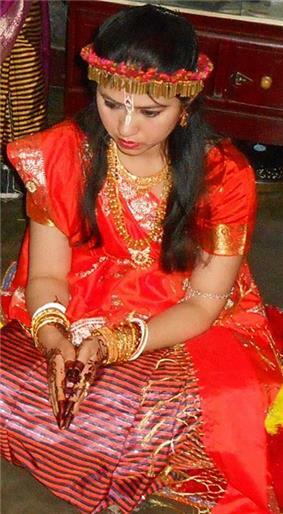 ^ Nilanjana S. Roy (8 February 2011). "Torchbearers for Victims in a Violent Land". The New York Times. Archived from the original on 22 October 2012. Retrieved 8 May 2011. ^ Rahul Pathak (6 August 2004). "Why Malom is a big reason for Manipur anger against Army Act". The Indian Express. Retrieved 8 May 2011. ^ Proctor et al. 1998. ^ "Namidapha National Park". north-east-india.com. Retrieved 14 January 2012. ^ "Manas National Park". Retrieved 14 January 2012. ^ "Kaziranga National park". Retrieved 15 January 2012. ^ "Orang National Park". Retrieved 17 January 2012. ^ "Pobitora Wildlife Sanctuary". Retrieved 17 January 2012. ^ "Keibul Lamjao National park". Retrieved 17 January 2012. ^ Thongkholal Haokip, India’s Northeast Policy: Continuity and Change, Man and Society – A Journal of North-East Studies, Vol. VII, Winter 2010, pp. 86–99. Watters, Thomas (1905). Davids, T. W. Rhys; Bushell, S. W, eds. On Yuan Chwang's Travels in India 2. London: Royal Asiatic Society. Retrieved January 29, 2013.